I hardly ever use lyrics so this may be a dumb question. When I start a measure with a lyric and an expression, the two invariably collide. In older versions of Finale I think there was a setting under Document Options that prevented this, but I don't see it in Finale 25.2. Is there some way to go back after the fact and un-collide everything without adjusting each one manually? The vertical collision plugin doesn't seem to help. I've not known of such a setting. There is a setting to keep syllables from colliding with each other, but not for collisions colliding with expressions. I don't do lyrics either until I was asked to put a piece in to Finale for publishing. I saw the same problem and was told by the publisher it was OK to put hairpins and dynamics on top of the staff. This image has been viewed 131 time(s). Not only okay, but standard for vocal music. Quite. In a vocal score, pretty much everything apart from the lyrics goes above the stave. This can even include articulations and triplet brackets/numbers on upward stems. So what do you do if you have multiple lines, like SATB, each with their own lyrics? I have seen some published score where they put them over every staff, with the resultant crowding and collisions. Is it acceptable to put them only above the top staff? Generally, you need to leave enough space between staves for lyrics of the staff above and the expressions of the staff below. It's just that because you don't want stuff between the notes and the lyrics, you might as well put it on the top, rather than below the lyrics. That's what I thought. But it can really limit what fits on a page. That's why choral music frequently uses a smaller staff size. I suppose the traditional solution would be to publish part books rather than a score. That works with instruments. You put your fingers there, and the right sound (usually) comes out. I think singers (speaking as one, myself) like knowing what the other parts are doing, and picking up the occasional pitch from them. I don't think I've ever seen a vocal part score. Well, they used to exist. 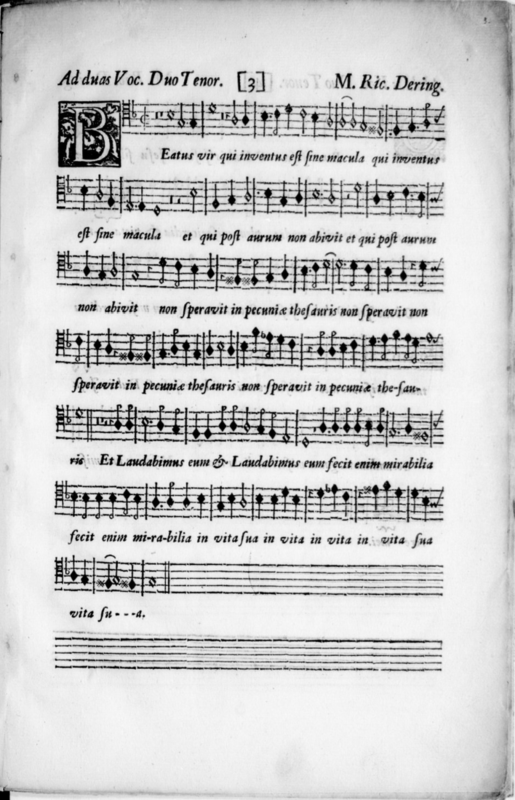 Have you ever seen (images of) those oversized velum books where each part was oriented in a different direction for singers that gathered around the one hand-copied book to see their part? The Middle Ages/Renaissance was a different world. The sort of music that used to appear in part-books (or choir-books or table-books) didn't really have much call for dynamics and other expressions! I always hated the Durand & Cie Vocal Scores, which had multi-measure rests and no organ part, save for a few cue notes. Here's a 1660 printed part. This image has been viewed 172 time(s). I suppose after trying to figure out how to fit syllables to the notes, dynamics and expressions would be the least of their medieval worries.